We’d love your help. Let us know what’s wrong with this preview of Butter Cream by Denise Roig. To ask other readers questions about Butter Cream, please sign up. I found this book very enjoyable. It didn’t make me want to go to pastry school, but it did give me a pretty good idea of what it would be like. I found a lot to interest me in her story, probably because I love baking and I love memoirs, so what's not to like? I think the most appealing part of the story is that the author is a beginner. She’s been baking all her life, but this is her first experience with “professional” pastry making. As a result, it’s an easy read for everyone. The reader lear I found this book very enjoyable. It didn’t make me want to go to pastry school, but it did give me a pretty good idea of what it would be like. I found a lot to interest me in her story, probably because I love baking and I love memoirs, so what's not to like? I think the most appealing part of the story is that the author is a beginner. She’s been baking all her life, but this is her first experience with “professional” pastry making. As a result, it’s an easy read for everyone. The reader learns the cooking terms at the same time as the author so there’s no “chef speak” leaving you wondering what the heck she’s talking about. Having watched lots of “reality tv” about chefs and cooking, I had a bit of an idea what to expect. It’s an incredibly high stress occupation, but like any other art, also very satisfying when you get it right. For people who are performance oriented, a beautiful cake or tart is a joyful accomplishment, even if you did drop, spill and wreck things in the process. It’s like poetry in a way. When you write a poem and you know it’s good, you feel immense satisfaction, but the pain/loss/fear/sadness you had to experience to create that poem was not enjoyable at all. Fortunately not every baking experience is like that, but some of the more complicated ones certainly can be. It’s worth it because of the beauty being created and the pleasure it will give to others. Well, ok, usually worth it. I am never, ever going to make petit fours no matter how much joy it would give anybody. The author is honest about her teachers and classmates. It’s refreshing that she’s the kind of woman who sees the good in everybody, and that she is also realistic about their flaws and limits. I was left with the impression that she is a warm, kind person, someone it would be nice to have as a classmate. I’d like to know her. She is honest, too, about her own abilities. As a 56 year old, she knew she would not have the energy of younger students, and that because of family and work responsibilities, it would get complicated for her when the pastry class demanded late nights, early mornings or weekends. She was often frustrated, sometimes lost, and at times driven to the limit of her endurance in class, but she stuck with it and reaped the rewards of her perseverance and determination. I’m not at all sure I would have made it. There are some basic recipes in the book, things like pastry cream, genoise, ganache and butter cream. I’m hoping to work on a couple of things to see if I can perfect them. Some things, like puff pastry, I will never attempt because it’s too time consuming and because it’s easy to buy it frozen at any grocery store. I love baking, but at this point in my life I also love easy. I learned some good things about method from this book, like how long eggs and sugar have to be beaten together and how to test that you’ve been beating them long enough, how to whip cream to get the best result, etc. I’ll probably be using the book as a reference in my kitchen, at least till I get pastry cream mastered. Really enjoyed the pastry-specific writing, however, the personal experience came across as overly whiny - it was tiresome by the end (but maybe that was the point). I am excited to delve into some of the recipes! 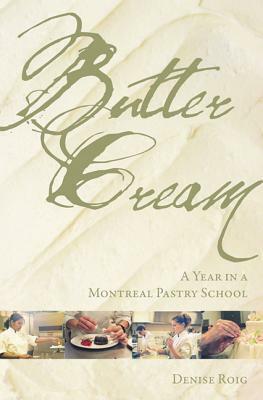 A very readable and engaging memoir that should be of interest to anyone who loves to bake, as well as anyone who has changed careers in mid-life. Denise Roig is the author of two critically received collections of short stories: A Quiet Night and a Perfect End (Nuage Editions), and Any Day Now (Signature Editions), and the memoir Butter Cream A Year in a Montreal Pastry School (Signature Editions). Her new book is Brilliant, a collection of short stories set in Abu Dhabi, the capital of the United Arab Emirates. Denise’s first collection wa Denise Roig is the author of two critically received collections of short stories: A Quiet Night and a Perfect End (Nuage Editions), and Any Day Now (Signature Editions), and the memoir Butter Cream A Year in a Montreal Pastry School (Signature Editions). Her new book is Brilliant, a collection of short stories set in Abu Dhabi, the capital of the United Arab Emirates. Denise’s first collection was translated in 2000 as Le Vrai Secret du bonheur (Éditions de la Pleine Lune) and her fiction has been heard on CBC’s Between the Covers. As a journalist, Denise’s work has appeared in The Gazette (Montreal) and The National (Abu Dhabi). Denise is the co-editor, with her husband Raymond Beauchemin, of two anthologies of Quebec English literature: Future Tense and The Urban Wanderers Reader.